Tune in to CJBN TV at 6:30 pm tonight, as the DHS Schools Building Schools group will be showcased on “Points North”. The footage was filmed at a Schools Building Schools training session here in Dryden and features images from Tierra Blanca as well as student interviews. Schools Building Schools is a student-run initiative based out of schools across Northwestern Ontario that aims to raise enough funds to build a new Tierra Blanca School in E Asintal, Retalhuleu, Guatemala. For more information on Schools Building Schools, check out their Facebook page. The Envirothon Team, accompanied by Mrs. Boone, went on a field trip on November 17, 2009. 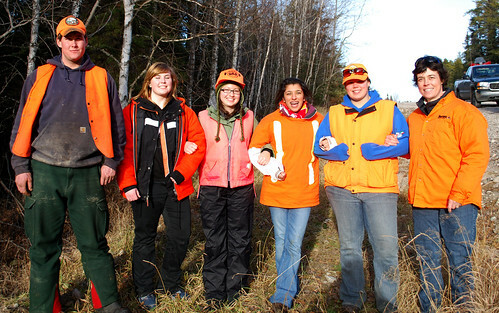 The team explored a local trapline with Dwaine Brown, President of the Dryden Trapper’s Council. The focus of the trip was to observe and learn about wildlife habitat; members of Envirothon had an awesome time. The team agreed that one of the highlights of the trip was standing on top of a beaver house and learning about beaver living patterns. DHS hosted its annual Remembrance Day ceremony this morning in the Gordon Wood Auditorium. The ceremony included a slideshow honouring DHS graduates who were killed or had served in the World Wars. Mrs. Palermo read a story that her father, a former DHS teacher, had written about a young man who died in World War II. The DHS band gave us a powerful rendition of “The Last Post” followed by a moment of silence. 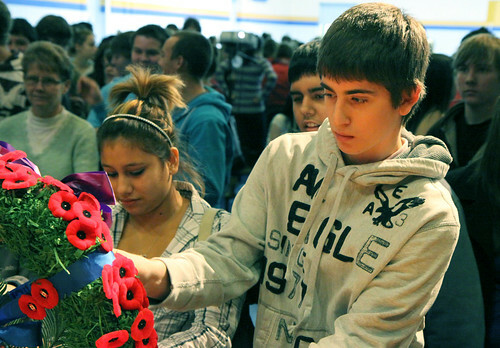 At the end of the ceremony, students came to the stage and pinned their poppies on a Remembrance Day wreath. Mrs. Gardams leadership class organized and set up for the ceremony. Thanks to them, and to all DHS staff and students that helped us to honour those who have sacrificed so much on our behalf.